Hydroxybenzene; Phenol; Benzenol; Phenyl alcohol. · Colourless, needle-like crystals which turn pink and liquefy when exposed to air. It is a coal tar derivative (creosote). 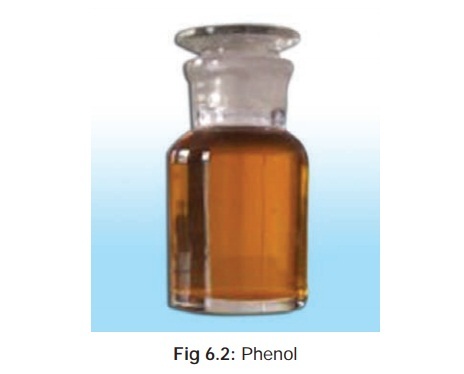 · Commercial phenol is a brownish liquid containing impurities like cresol (Fig 6.2). Household phenol (often sold as phenyle) contains 5% phenol in water. It has a characteristic, aromatic odour (“hospital odour”). · Tannic acid: Least Toxic. · Antiseptic and disinfectant: especially for sterilising floors,walls, furnishings, glassware, and instruments. · Preservative: Phenol is a commonly used preservative ininjectable medications, e.g. glucagon, pethidine, neostig-mine, quinidine, and epinephrine. o “Face peel” in plastic surgery. o Neurolysis for spasticity (by injecting phenol solution into neuromuscular junctions). o Phenol is still used in preparations for treatment of localised skin disorders (Castellani’s paint), and as a local anaesthetic. · Probable oral lethal dose is reported at 50 to 500 mcg/kg. · have been reported even with much less quantities. The UFD for Lysol is 60 to 120 ml. Carbolic acid is rapidly absorbed through GI mucosa, lungs, and even intact skin. Dilution may actually increase absorption and enhance toxicity. Carbolic acid is actually a very mild corrosive, but has profound systemic effects after absorption. There is CNS depression, metabolic acidosis, and renal damage. Local: Skin or mucosal contact results in mild corrosion with hardening and whitish discolouration. However the white eschar (especially in the skin) drops off in a few days, leaving a brown stain. Locally there may be burning pain followed by tingling, numbness, and anaesthesia. · CNS—Vertigo, convulsions, coma. Pupils are constricted. · RS—Tachypnoea, bronchospasm, pulmonary oedema. · CVS—Tachycardia, hypotension, cardiac arrhythmias Blood—Haemolysis, methaemoglobinaemia. · Metabolic—Hypothermia, with cold and clammy skin, metabolic acidosis. · Hepatorenal—Oliguria, with scanty urine which turns greenish or brownish on exposure to air because of phenolic metabolites (hydroquinone and pyrocatechol). Later there is renal and hepatic failure. · Deaths have occurred even after skin contact with carbolic acid. Table 6.2 lists the agents which can cause serious poisoning through dermal absorption. This was common in earlier days among medical personnel when phenol was routinely used as a skin disinfectant. It is characterised by anorexia, weight loss, headache, vertigo, dark urine, and pigmentation of skin and sclerae (ochronosis). · Typical odour in the vicinity of the patient. · Urine collected and stored in a transparent container shows a gradual change in colour to brown or green (Table 6.3 contains a list of poisons and drugs which discolour urine). · To 10 ml of urine, add 1 ml of 10% ferric chloride. A purple or blue colour which persists even on heating indicates phenol poisoning. Cresol is associated with green colour. · When 10 ml of urine is boiled with Millon’s reagent,* a red colour is produced. · Decontaminate skin by copious washing. · Stomach wash can be done preferably with sodium or magnesium sulfate solution. · Activated charcoal in the usual manner. · Treatment of methaemoglobinaemia (with methylene blue). · Convulsions can be managed with benzodiazepines or barbiturates. · Distinct odour of phenol, especially around the mouth and in the stomach contents. · Corroded areas are at first white, but if death has been delayed they turn brownish (Fig 6.4). Gastric mucosa is greyish white, swollen, and hardened (leathery), but Lysol poisoning is asociated with soapy and soft mucosa. · Urine is greenish or brownish. Most cases of poisoning are accidental in nature arising out of occupational exposure or therapeutic misuse. Formerly, suicidal ingestions were common. Poisoning with phenolic derivatives causes similar but usually less severe manifestations, and must be treated on the same lines as phenol.